JKBOPEE Answer Key 2019: Jammu & Kashmir Polytechnic Entrance Test Answer Key 2019 is available now for JKBOPEE Jammu & Kashmir Polytechnic Entrance Test 2019. The exam was organized by Jammu & Kashmir Board of Professional Entrance Examinations . 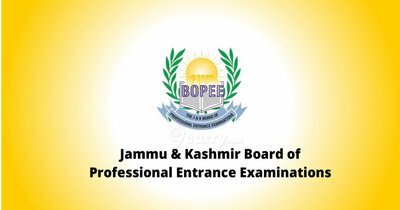 JKBOPEE Jammu & Kashmir Polytechnic Entrance Test Answer Key 2019: Jammu & Kashmir Board of Professional Entrance Examinations has issued the Answer Key on 08 Apr 2019 for JKBOPEE Jammu & Kashmir Polytechnic Entrance Test 2019. Answer Key can be accessed from the link given below. JKBOPEE B.Ed(K) Entrance Test Answer Key 2019: Jammu & Kashmir Board of Professional Entrance Examinations has issued the Answer Key on 25 Mar 2019 for JKBOPEE B.Ed(K) Exam 2019. Answer Key can be accessed from the link given below.